"HARVEST OF BLOSSOMS: Poems from a Life Cut Short"
Edited and with an introduction by Irene and Helene Silverblatt. with Helene and Irene Silverblatt. 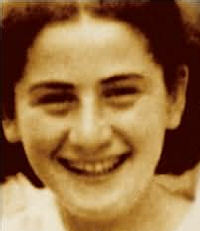 Selma Meerbaum-Eisinger died in a Nazi SS labor camp on December 17, 1942. She was eighteen. In the course of a life cut short, Selma reached out to the world with poetry, and her words grabbed life, even as the world around her was slipping into an arena of death. During these grim times, she wrote more than fifty poems in German and translated another five from Yiddish, French, and Romanian. With startling honesty, she wrote about love and heartbreak, desire and loss, injustice and marred hope. Selma found beauty in the fragility of chestnuts, comfort in the loneliness of rain, and grief in rural poverty and, with despairing courage, faced a future that wanted her--and an entire way of being--to "fade like smoke and leave no trace" ("Tragedy"). Selma came from Czernowitz, a place famously described by her cousin, renowned poet of the Holocaust Paul Celan, as a city "where human beings and books used to live." Located at the far eastern edge of the Austro-Hungarian empire, Czernowitz, now Chernivtsi in Ukraine, was the capital of the Bukovina, a lush region marked by the Carpathian Mountains and a swirl of ethnicities--Ukrainian, Romanian, Armenian, German, Polish, and Jewish. Turn-of--the-century postcards show people from these different cultural backgrounds, in distinctive dress, mingling in streets, talking in public squares, and shopping in marketplaces. In 1924, when Selma was born, Czernowitz was under Romanian rule, but even so, an Austrian ethos permeated the city, endowing it with a legacy of multilingual traditions and a profound love of German culture. Selma spoke German at home, and her romance with poetry began with the German masters; nonetheless, she lived in a city where German was in dialogue with other linguistic traditions, and her poetic sensibilities were kindled by Czernowitz's riches in language and culture. Unfortunately, we know little about Selma. Scholars speak of her in larger works about German literature in the Bukovina; some of her friends wrote about her in their memoirs; and others talked about her to Jürgen Serke, a German journalist who included their stories in his introduction to Selma's collected works. Now, sadly, it is too late to ask much more about the facts of her life. Most of Selma's friends and family who survived the Holocaust are no longer alive today; there are only a few left who can answer our questions. Chernivtsi celebrated its six-hundred-year anniversary in 2008, and Jews have lived in the region for at least that long. Although their Czernowitz roots were centuries deep, Jews only became a significant presence in the mid--nineteenth century, after Czernowitz was designated a provincial seat of Austrian imperial rule. By 1910 Czernowitz was a jewel in the enlightened Hapsburg Crown, and Jews constituted one-third of the city's population. Jews took advantage of the Hapsburg Empire's policies of tolerance and drives to modernize the East: they attended university in great numbers, were eminent professionals and active citizens, and held national and local political offices. Like emancipated Jews in Austria and Germany. many in Czernowitz took the German enlightenment as their faith and cobbled a bible from its philosophy, plays, and poetry. Many, including Selma's mother, our grandfather's sister, became passionate Austrians and champions of its politics and culture. "Little Vienna, it was a little Vienna"--that's what our Czernowitzer grandparents, aunts, and uncles used to say when we would ask them where they grew up. Czernowitz did (and still does) look like a smaller version of the Hapsburg capital, with less grand--but still elegant examples of its turn-of-the-century architecture in generous display. Evidence of imperial power was there for all to see in government buildings, such as the city hall, but its presence was also felt in the city's cultural arenas: in the philharmonic hall, university buildings, state theatre; parks, and gardens. Although the infrastructure's deterioration accelerated dramatically after the collapse of the Soviet Union, the city's elegant shopping avenues, the Hapsburg double-headed eagle on manhole covers, and pastry shops with Sacher torte remain as echoes of Chernivtsi's "Czernowitz" past. So we can still see where Selma lived and can imagine her walking along these cobblestone streets, having coffee in the cafes, enjoying the blossoms in the gardens, reading poetry in the parks, and seeing plays in the elaborately decorated theater. "Little Vienna" shaped Selma's life. Selma and her friends would have attended lectures, concerts, and political meetings in Czernowitz's "ethnic houses;' remnants of the Hapsburg Empire's multicultural ethos. In 1911 the Hapsburgs experimented with a model of government that granted ethnic groups proportional representation in parliament, and Czernowitz was seen as a testing ground. The German House, Ukrainian House, Jewish House, and Romanian House, centers for cultural activities (literary readings, musical offerings, and folklore displays), were also hubs of Hapsburg political life. In a nostalgic light, the Hapsburg Empire can seem a wonder of multiethnic affirmation. People of different origins and cultures did manage to live together and, at times, even enjoy one another's differences. The Hapsburgs' promotion of ethnic cultural politics seems exceptional, perhaps farseeing. But economic inequalities tore at the Hapsburg cultural fabric and other political dreams simmered beneath the surface. As Selma found out only too well, history has proven the limits of the Hapsburg romance. Czernowitz's Jews became all too familiar with anti-Semitism in the years prior to Hitler's rise to power. Even before Ion Antonescu, one of Hitler's closest political allies, declared himself the leader of Romania in 1940, a virulent Romanian nationalism was enjoying growing popularity throughout the country. It gravely affected opportunities for Jews in Czernowitz. For the first time since Austrian emancipation, Jews found themselves the brunt of official scorn and hatred. Quotas were drawn; limits were set. Jews were harassed in the streets and markets. One stunning case of institutionalized anti-Semitism, known as the Fallik affair, left a heavy mark on the Jewish community. When Jewish students scuffled with an anti-Semitic professor who they felt had unjustly failed them in baccalaureate exams, they were arrested and charged with, among other crimes, defaming the honor of Romania and Christianity, At the trial, a Romanian nationalist murdered one of the student defendants, David Fallik. The murderer was eventually--and infamously--set free by the courts. Newspapers and authorities praised him as a patriot; the Jewish community, outraged, had the word Kadosch (holy) inscribed on David Fallik's grave. Czernowitz, where cosmopolitan hopes mingled with the passions of ethnic nationalism, offered a distinct cultural environment for artists and writers. The German literature that emerged from the Bukovina, as Amy Colin forcefully argues in her article "A Tragic Love for German," harbored dimensions of these cultural struggles. On the one hand, the pull of German language and its cultural ideals must have been prodigious; the Bukovina tradition of German writers--Jews and non-Jews--blossomed not only when the region was under Austrian rule but after the Hapsburg Empire collapsed and the Bukovina was ceded to Romania. Following World War I, German was spoken in a significant number of homes and remained a sacred idiom of sorts--the language of civilization's most eloquent ideals in poetry, theater, and thought. But, as part of this polyglot Bukovina tradition, Czernowitz German was tempered and enriched by the many other languages heard in the capital's thoroughfares, cafes, and classrooms. This was Selma Meerbaum-Eisinger's linguistic home. The attraction to Germanness, the attraction of assimilation, drew many. Other Czernowitzer Jews saw assimilation as a curse and prized Yiddish--the language of cultural secularism--as the badge of Jewish nationality. Thus Czernowitz, that bastion of German assimilation, was also a bastion of Yiddish culture: the city where the first international Yiddish conference was held and the city that produced some of the language's most beautiful and haunting poetry. Of course, there was middle ground between deprecating Yiddish as corrupt German, as some Germanophiles would have it, and declaring Yiddish a national language: Selma was a German speaker, but she also loved Yiddish, as her translations of Yiddish poetry confirm. One entered [the apartment] through a long corridor, a couple of steps led to the first floor, directly into the kitchen. Electric light ... there was none. In the large room stood a master bed. At the foot of it a sofa, upon which Selma slept, also two chests and between them a small writing table for Selma, No running water, no bath. Selma's poverty was notable enough for Pearl Fichman, another friend, to highlight it in a letter to the State Theater of Fürth in Germany when a performance piece about Selma and Czernowitz was being planned by the theater company. But Fichman was quick to point out that wealth counted for little among the young adults who were Selma's closest friends, "I was just thinking," she wrote, "that Selma came from a very poor milieu and indeed her girlfriends Renee and Livia came from rich families--[however] with us ... money was unimportant--personality, talent--these played the only role." And what personality, what talent. Alert, sparkling, mischievous--these were the words that best described Selma. Her childhood friends speak of her liveliness and irreverence as well as her sensitivity and modesty. They describe her enormous gifts and her shyness about revealing them. Else Schachter--Keren, a childhood friend also interviewed by Jürgen Serke, portrayed Selma as "always in motion." Nighttime was the time to go out: to the park, to the gardens, to evening concerts. Such constant goings, of course, could be at odds with parental wishes: "At ten o'clock she would come to our house and whistle to have me come out. [And], my mother would say, ... 'why must you go out walking so late (?)''' Selma just couldn't keep still. She "loved to dance" and was "the most boisterous" of their group, "She wanted to live out every moment." Selma was also a great friend of Bertha Scherzer, whose younger brother Julius Scherzer, wrote about Selma in his memoir: "Selma [was] a sprite of a girl, with dark shiny eyes, curly, unmanageable hair, and a scattering of freckles across her shapely nose." The unmanageable hair was a feature that other friends noticed as well. In Renee Abramovici-Michaeli's words, Selma simply had "frizzy hair," and she describes the fights between Selma and her mother over hairstyles--particularly over the need for braids. We gather that occasionally these discussions reached such a fevered pitch that Renee was afraid they wouldn't get to school on time.'" (Selma must have won because the only photos we have show Selma with her hair down.) Selma's hair also caught the attention of Pearl Fichman, who described it as a crucial component of Selma's image, "striking, but a little sloppy." Selma tended to be "careless about her looks": when alone, she "looked preoccupied, oblivious of the world around her." And when walking with friends, especially with her boyfriend, Leiser, Selma "seemed rather lost in thought and impervious of appearance"--in contrast to the "introverted ... neat, all in control" Leiser. "The mouth--defiant testimonial of proud aloofness,/ l strengthened by a delicate black fuzz." In "Red Carnations," she pleads with Leiser; "I trifled, yes, I know--forgive," and then beseeches him, "And even if your hand should hold another thousand stars--it can grasp even ten thousand more." Perhaps, then, Selma was the first to cause heartbreak ,and Leiser refused to take her back. As Selma explains in "Necklace of Tears," "Well, happiness was just too heavy for you." There is another anecdote that has become part of Selma's story. It's a tale from school that illustrates her zest for knowledge, her irreverence, plus her strong will and sense of self. We don't know what Selma's precise course of study was, but it probably included Romanian, math, sciences, Latin, French, German, history, and geography. It seems, however, that neither the subjects nor the teachers were always to her liking. Selma could get really bored in class and felt little compunction about making it known, So, we are told, if Selma did not find the classes appealing, she would figure out something more engaging to do. "When the lesson did not interest Selma," friends commented, she would hide under the desk or "go under the bench" and "read whatever pleased her." "The ferment of literary and social activity was almost physically felt in our town." It was a palpable force and lodestone for Czernowitz youth: Czernowitz--the city "where human beings and books used to live," the city where books and ideas breathed and talked and listened. Selma and her friends worried about the world. They worried about its inequities, about right-wing populism and the allure of Hitler and his European allies. According to all accounts--memoir, biography, and interview--Selma and her companions saw answers in the Left. But the Left was fractured: there was a secular Left of communists, socialists, and anarchists, as well as a more cultural Left, including Yiddish Bundists and Labor Zionists. Paul Celan threw his hat in with the first group, but Selma was a committed Labor Zionist whose political dream was the creation of a homeland for Jews in Palestine that would be built around principles of economic and social equality. The members of Hashomer Hatzair, the name of the Labor Zionist youth group, were like a family; they studied together, danced together, and read poetry together. Students pursued their passions even though it could be dangerous to do so. The changes in education advanced by Romanian nationalists were accompanied by palpable anti-Semitic sentiments, and teachers bullied their students with impunity. Nonetheless, these prejudices against anything or anyone not "Romanian" couldn't stop students like Selma from following their ardent interest in other languages. Nor could arrests, like the detention of three of Pearl Fichman's friends, stop the city's youth from engaging in political discussions that challenged their country's right-wing nationalism and the status quo. Else Schachter-Keren, in her memoir, described these changes and the climate in which Selma wrote: "As the war approached closer to us, we felt that we would be robbed of our youth. We were no longer able to seek out our gardens and meadows, we had to find hiding places. On such long and lonely evenings Selma wrote her lovely poems:"
Although the public schools used Romanian as the language of instruction, German was the language that Selma spoke at home and with her friends, and it was the language of her poetry. These young poetry lovers were well acquainted with German verse before German became a school subject, and its literary culture exerted a significant influence on their writing. Selma and her companions would hold dramatic readings of Rilke's and Heine's works in their favorite parks, and they would discuss Goethe, Freud, and Kafka in the summertime by the banks of the Prut River. They were literary cosmopolitans: their fascination with language and their joy in words ignored national boundaries. Selma adored Verlaine and Shakespeare, was enchanted by Chinese literature, and loved Rabindranath Tagore, whose novel The Home and the World she took with her to dle Michailowka labor camp. Ever curious about language and its subtleties, Selma enjoyed translating poetry into German; indeed, five of her surviving poems are translations from French (Paul Verlaine), Yiddish (Itzik Manger and H. Leiwik), and Romani.1n (attributed to Discipol Mihnea). Selma's poems had a mixed reception in Czernowitz, even from her companions in the Hashomer Hatzair. Else Schachter--Keren reports that most members of the Labor Zionist group laughed when they first heard Selma's poems. This explains why Selma was so reluctant to share them, why, in fact, "she seldom showed her poems ... to anyone." Schachter-Keren, however, made it forcefully clear to Jürgen Serke how much she herself admired Selma's talents: "I found her poems lovely, I told her so." Else felt so moved by Selma and her tragic death that she wrote "They Drove My Sister Out," a poem that grieves the excruciating loss of her friend and her friend's poetic genius by incorporating some of Selma's lyric imagery into its verses. It is painful to imagine Selma being laughed at. But we do know that others admired her poetry. Pearl Fichman devoted a chapter in her memoir to Selma. Julius Scherzer seemed in awe of his sister's friend, who "already wrote poetry." We know that Leiser Fichman thought Selma's album so precious that when he decided to go to Palestine illegally in 1944, he gave the album to Else Schachter-Keren for safekeeping. (As we will see, that decision saved Selma's poetry from oblivion.) And poignantly, in 1968, Paul Celan would permit a German press to include his masterpiece "'Todesfugue" in an anthology only if Selma's "Poem" was published next to his. Thus Celan paid tribute to his cousin and was responsible for Selma's first published verse. In the summer of 1940, the Soviet Union, with the blessings of the Stalin-Hitler nonaggression pact, expanded its western borders and incorporated the northern Bukovina, including Czernowitz, into an enlarged European buffer zone. The Soviet takeover was welcomed by some with the faith that communism would fulfill its promise of a more just world--including reigning in nationalist anti-Semitism. There were even members of Hashomer Hatzair who believed (and hoped) that the Soviets would support the youth group's project to create a socialist society in Palestine. On the one hand, the Soviet invasion opened Yiddish language schools, expanded Yiddish theater; and allowed some Jews to escape to the East; on the other, it deported men and women to Siberia for reasons as arbitrary as being the wrong kind of socialist, being a shop owner, or being an ethnic German--even an avowedly anti-Fascist German who refused to countenance Hitler's vision of a greater Germany. The Soviet occupation was an early lesson in disillusion mixed with hope, a lesson in the capriciousness, inhumanity, and deliverance of power. One year later, Hitler invaded the Soviet Union, and with the Red Army in shambles, Romanian and German troops entered Czernowitz. Czernowitzers were well aware of Hitler's venom, but nothing could prepare them for what was to follow. Even the tightening vise of 1930s Romanian anti-Semitism was a meek. prelude to the horror of German occupation. Angry and astonished, the Israeli novelist Aharon Appelfeld described, in his memoir, the terrible fate of so many Jews living on the outskirts of Czernowitz who, like his mother, had been massacred by local gangs or killed by Romanian soldiers with the help of neighbors. Czernowitzers watched, shocked, as bloodied victims tried to escape to tile city; they listened to the victims' stories of pogroms in the villages of northern Bukovina and of murder orgies in Bessarabia and lasi, Romania. Czernowitzers also witnessed destruction and mass murder within the city's walls as German and Romanian troops set out to destroy emblems of Jewish life. SS troops looted the temple and then set it on fire; German soldiers killed the religious leaders of the Jewish community, including the rabbi and cantor. Locals ransacked Jewish-owned businesses and houses with the obvious approval of German and Romanian officials. Terrorized, Czernowitzers observed large-scale slaughter as SS and Romanian troops, for sport, went into Jewish neighborhoods and randomly selected men for execution. The questions still haunt us as they haunted Czernowitz: how, in a universe where cultural diversity had been officially recognized and formally supported; where citizens had to master cultural differences in order to master Czernowitzer reality; where these differences were often understood to enrich life; where, as a contemporary Chernivtsian told us with considerable pride, "even the street cleaner spoke four languages (Ukrainian, Russian, Yiddish, and Romanian)"--how could this universe promote a hatred so brutal that Czernowitzers who happened to be Jewish were stripped of citizenship, enslaved for being Jews, and treated so viciously that over half didn't survive the war? We cannot erase from our memories something else we were told by the same gentleman: "It was not Germans, not Romanians, but people who lived right here, who came from this place, who got such pleasure in killing." "The next moment we were face-to-face with the patrol. One of the civilians must have recognized we were Jews. 'There was hatred in his eyes, vicious hatred that conveyed the message, "I want you dead," With the slur "jidani bolsevici" (Bolshevik Kikes) on his lips, he pushed the piano off the cart and into my father's chest .... It then crashed on the cobblestones, trapping my father's legs ....The other civilian ... grabbed the piano's music stand from Selma's hand and smashed it against her head. The wooden stand broke under the force of the blow. Selma staggered, while blood streamed from a large gash on her forehead. It ran down her face and formed deep red blots on her white blouse." photo: Cover of first edition of Selma Meerbaum's poems. Courtesy of Irene Fishler and Ilya Ehrenkranz. When the Romanian patrol and their local supporters move on to their next target, Julius Scherzer's father and Selma were left bloodied and distraught. Bertha, Julius's sister, wiped the blood from Selma's face while Julius's mother and a porter tried to lift up his father, who was pinned, with a broken leg, under the piano. They continued on to their new home, where a doctor set the broken leg and bandaged Selma's head wound. This incident must have been a defining episode in these young people's lives, a final loss of innocence. Julius described this encounter with "unrestrained evil and brutality," with men "filled with hatred and rage ... bent on inflicting pain and destruction." And he recognized the terrible truth of it: "Only later did we realize that in spite of our misfortune, we had been very lucky. We were alive." Imposing the new German-allied Fascist order, the Romanian government in Czernowitz instigated measures of terror directed principally against leftists and Jews. Communists were rounded up, imprisoned, and shot. Jews were stripped of citizenship. All had to wear a public symbol of their identity: the infamous yellow star, visible at all times. Using racial criteria as a guide, all Jews--whether religious or not, whether right-wing or not, whether gifted or not, whether young or not, whether Zionist or not, whether Bundist or not, whether soldiers who fought on the same side as Germans in World War I or not--became state pariahs. Jews had to be monitored and controlled. First a curfew was imposed. Jews were not allowed to freely inhabit public spaces: they couldn't walk in the streets, meet in the city hall plaza, go to the theater, attend school, buy food, look for doctors, or meet friends--with the exception of a two-hour period from ten until noon. Then Jews were prohibited from freely choosing where to live. By a decree issued the second week of October 1941, all Jews were forced to leave their homes and neighborhoods and move to a confined, marginalized section of Czernowitz. Any caught in town could be summarily shot. Jews became prisoners of the ghetto. Life in the ghetto was intolerable, Overcrowding coupled with a lack of electricity and running water created inhuman conditions. 'To give a sense of what it was like, Pearl Fichman described how she and her family were initially camped with forty--five others in two rooms and a kitchen." Apparently Selma Meerbaum--Eisinger and her parents, not knowing anyone with available space in the ghetto, had to take refuge under a bridge. According to Julius Scherzer, at a later point Selma and her grandmother lived in a two-room apartment. When the Scherzers no longer had a place to go and were wandering the ghetto streets, Selma and her grandmother took them in. After the ghetto was established, Romanians began to round up Romanians who had been deprived of their citizenship because they were Jews and to deport them to what was called the Transnistria, a region across the Dniester River in Romanian-occupied Ukraine, These resettlements, as they were officially known, took place periodically, according to a calculus built around labor needs, privilege, and hatred. In the summer of 1942, the government deported more than two thousand ghetto residents, sending them across the Dniester. Among them were Selma, her parents, and Paul Celan's parents. First they slaved in a stone quarry, Cariera de Piatra; then they were ordered to a labor camp in Michailowka, a village further cast, near the river Bug, in German-occupied territory. It is there that all five died. Rena, Tatanca , it is so hot here that I am too lazy to close my eyes, that I am not able to hold a pencil, and find it hard to toss a thought through my head. Nevertheless I want to write to you. Actually, I don't even know whether I will have a chance to send you this scrap of paper--never mind. Now I have at least the impression that you are sitting next to me, that I can talk to you after almost a year. What do I say; almost a year. Actually, it is over two years since the time when we spent long afternoons together without talking; afternoons when you were playing (the piano) and I was listening and both of us knew how the other felt. Perhaps it is no good bringing back these memories. But never mind. I don't know how you feel, but I sometimes long for the unspeakably sweet pain of such memories. There are moments when I try to conjure up a specially hot, live picture and don't succeed. At most, once a fleeting touch of a face or a word, but without really grasping or absorbing it. I sometimes think: Berta. Or--Leisiu [Leiser]. Or--a kiss. I don't grasp the meaning of these notions. Let's leave it. I have a poem here, the author of which I don't know. It is beautiful. Nettchen, how long will this go on? How do you bear it? I have been here less than three months and I imagine that I will surely go out of my mind. Especially in these unspeakably bright and white nights that overflow with longing. Sing sometimes, late at night, when you are alone: Poljushka. Perhaps you will understand my frame of mind. Do you remember the fifth chapter of "Home and the World"? I'll copy a few sentences: "Why can't I sing? The faraway river glitters in the light; the leaves glisten; the morning light spills over the earth like the love of the blue heavens and in this autumn symphony I alone remain silent. The sunshine of the world hits my heart with its rays, but it does not hurl them back: August is here. The sky sobs wildly. And streams of tears crash on the earth and, oh, my house is empty." I feel as if all my coming days are freezing together into one solid mass and will live forever on my breast. Rena, Rena, if only you were with me. I don't know, maybe, if we were together, it would be too much. Maybe not. Anyway we could still endure it for a month, if we were together. Of course, one bears it anyway. One endures, although one thinks again and again: Now, now it is too much. I can't bear it any more, now I am breaking down. Just now Tunia brought me a note from Rochzie. I am using this chance to send you this incomplete outpouring. An anguished cry of a letter--painfully direct and with little comfort. Selma's plaintive voice--honest and courageous--pushes us to imagine untellable suffering, disconsolate emptiness, and the youthful longings for a kiss, for sustaining friendship, for the sensual, everyday details of home. We share her struggle to articulate the incomprehensible; we hear her whisper hope in spite of--or because of--the impossibility of it all. We better grasp the undying importance of language in Selma's life, of the living presence of poetry, phrases, chapters of novels--and letters. We are stunned by the simple beauty of Selma's words. We are amazed that this letter could have been written at all. It is our privilege that this piece of writing, not meant for our eyes, has survived. We know about Selma's last days only because of Arnold Daghani, a Romanian artist who, in addition to drawing occasional portraits of life in the camp, kept a comprehensive diary. "Her voice became ever smaller and weaker. Then it was still." This is Daghani's entry for December 16, 1942, a description of Selma's final moments. Like many in the camp, including her parents, Selma succumbed to typhus, a disease born by flea- and lice-infested rats. Daghani also composed a pencil drawing of Selma's death: her body, wrapped in what appears to be sheets, as if it was being lowered on a ladder from the upper bunk. In the drawing, Daghani depicted other inmates, sad and observant, watching as two men were poised to receive the shrouded body. He named his drawing of Selma's death "Pieta." We do not know if Selma or her parents knew Daghani before they were forced to share the hardships of Michailowka; regardless, Daghani must have been quite taken by Selma--by her intelligence, her mettle, and her heart. Selma figures in Daghani's observations of the ironies of camp life and death. He wrote in his diary that Selma and a Professor Gottlieb, who died of malnutrition, "had been buried together:' even though "when alive, both were at loggerheads." Daghani also found Selma's opinions noteworthy enough to record. Apparently she was quite forthcoming with critiques or his drawings, particularly those depicting life in Michailowka. Months after Selma's death, Daghani wrote in his diary, "To Selma the works look tame, as according to her they did not show sufficient cruelty." Cruelty was certainly present in Daghani's entry on December 18: "Selma's mother has told me that her daughter was on the verge of making a getaway with a guard's help before she was taken ill. She has it from a farewell-Ietler addressed to her, found in Selma's coat." Daghani then wrote, "To my surprise I also learn that Selma used to write poetry that was highly thought of." In 1942, days before she was sent across the Dneister River to Michailowka, Selma collected her poems in an album she called Blutenlese (Harvest of Blossoms) and dedicated them "with love" to "Leiser Fichman, in remembrance and thankfulness for a lot of unforgettable beauty." Underneath the album's last poem, "Tragedy," Selma wrote these final words in red pencil: "I didn't have time to finish writing. It's too bad you didn't want to say good--bye to me. I wish you the best." Selma gave Blutenlese to her friend Else Schachter-Keren in the hopes that Else could somehow get the album to Leiser, who had been deported to a Romanian labor camp. We don't know how Leiser got the album, but he did. Leiser must have prized Blutenlese, because he kept it with him through his internment. In 1944, after the camps had been liberated, Leiser decided to escape to Palestine. In Czernowitz for one last time, Leiser gave Blutenlese back to Else. He was afraid that something might happen to the album during his journey: "I...don't want Selma's poems to be lost if I do not make it." Leiser's ship was torpedoed and sank with no survivors. Alter the Russians recaptured Czernowitz and deportees straggled home from the camps, Else gave Blutenlese to Renee Abramovici-Michaeli. With Selma's album in a rucksack, Renee began a refugee's extraordinary journey across Europe. On foot, riding in horse carts, or scrambling on the roofs of passenger trains, she traversed Poland, Hungary, Czechoslovakia, Austria, Germany, and France. Renee kept Selma's album near her, in her rucksack, throughout her four-year trek. When she was finally given permission to go to Israel, Renee packed her goods in a trunk but kept Blutenlese in her backpack. It's fortunate that she did: the trunk was lost, but Selma's poems survived." For nearly thirty years, Renee held on to Selma's album. Renee didn't discover Else Schachter-Keren or their math teacher Hersh Segal, another admirer of Selma's poetry, until 1976, even though they had all been living in Israel. Segal--one of those extraordinary teachers who truly change lives--was determined to make Selma's poetry accessible. However, he could not find a publisher in Israel willing to take on a (German--language project, so he organized a private printing. Financed by other Czemowitzers and Selma's family abroad, Blutenlese came to life again in 1976. And in 1979 TeI Aviv University republished it. But, as we mentioned, if it hadn't been for Paul Celan, Selma's poetry might never have had a commercial German publication. Celan's insistence that one of his cousin's poems appear next to his made Selma's poetry available to a wider German-language public for the first time. It was in that publication that Hilda Domin, a celebrated German poet, read "Poem"; "a lyric that one reads in excitement while weeping: so pure, so beautiful, so bright, and yet so threatened." Domin showed "Pocm" to Jürgen Serke, who has made it his life's mission to track down German poetry written by artists in exile. Thrilled by the discovery, Serke went to Israel to see if he could uncover more of Selma's poems. Going from one Czernowitzer home to another, he ultimately found the original Blutenlese and Hersh Segal's private publication. 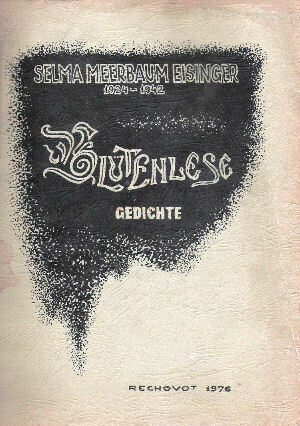 Serke then worked with the publisher Fischer Verlag (and later with Hoffmann und Campe) to produce the entire Blutenlese, thus offering Selma's poetry to a broader audience. His introduction to the text, along with an article in Stern magazine, told the story of Selma's life, her poetry, and his felicitous search. This edition, appearing in 1980, resulted in Selma's first touch of renown. Today Selma's original album is housed in Israel's Holocaust memorial, Yad Vashem, and, thanks to modern technology, some pages are available online. Between the middle of 1939 and the last days of 1941, a young woman inhabited a senseless, "civilized" Europe. Between 1939 and 1941, a young woman was flooded with the longings and sensuality of youth, was struggling to understand the horrors--and the beauty--of life around her, was moved to her soul by words. Between 1939 and 1941, Selma Meerbaum-Eisinger wrote fifty-seven poems that she put in an album called Blutenlese. Selma's poetry weeps with yearning: for a rejected love, yes, but also for the wonders of spring, for happiness, for "freedom in all things;' for the chance to live an ordinary life in a decent world. Many of Selma's poems insist on the beauty, insight, and even comfort of Czernowitz's natural bounty. Like the Romantic poets she loved, Selma finds soul mates in the trees, the sky, the rain, and the sunshine of her dear Bukovina. Nature can outline the sorrow of its human interlopers, mirror their ecstasy, sympathize with their frustrations. and mock their weaknesses. Nature's eternal cycles can provide comfort in the depth of winter or dull the pain of a broken heart. But as Selma's universe becomes increasingly tenuous, nature's visage changes: the natural world offers solace in her later poems but only at times and of tell begrudgingly. In Selma's early poems, nature contains a universe of promise. In "Spring," she revels in the glory of the season, when a child's eyes hold "the clover soon to come" and when silence risks being overwhelmed by passion. She also admires chestnuts, which offer comfort: to both trees and humans, who, like all living things. must accept the end of summer. We can imagine Selma grinning at humanity's foibles in "Afternoon," when she writes about a selfish "green fly" that doesn't want to share a "sun-drenched bench" with a "tiny yellow butterfly." The longing that engulfs Selma's poetry is often projected onto a dreamscape of nature. In another early poem, "A Stroll," it is the dead of winter, and "the air is quiet, filled with yearning"; and the ghostly trees seem "phantomlike." Yet Selma finds promise in the bits of yellow-green peeking through fields that otherwise "are merely clods of darkest brown" and finds hints of joy in the sparrows playing there "like raucous children." Czernowitz, off in the distance, is beckoning--"an image from a fairy tale," "the contrasts produced in nature's customary cycles and the allure of Czernowitz express longing and anticipation for a summer that will most certainly come. These sentiments are repeated in "Crystal," another winter's poem, where we see, at one glance, "a bench, a lonely site" alongside the hopefulness of "a little patch of grass, half-frozen, which the sun has chosen as its darling." By contrast, the dreamscapes in Selma's later poetry take on a startlingly different cast. Two of Selma's most haunting poems, "I Am the Rain" and "I Am the Night," portray an ambivalent natural world. Rain is sadness and mourning, "barefoot, /walking along from land to land," Clothed in a dress "grayer than grayest grief," Rain stands for the history of weeping women everywhere, as she holds "all the tears that ever fell/ from the lips of pallid girls." Night, Rain's seeming partner, stalks and entrances sorrow with the promise of deadly relief: Night, whose seductive veils are "softer than is pallid death," gathers "every burning ache/ into [her) chilly pitch-black boat." "Fairy Tale," also written in 1941, conveys alarmingly bitter disappointment and deadening, suffocating desire. Again Selma scours nature for hope, but she is "lost in the deepest forest:' like "deepest yearning" with eyes that are "blind and dead:' This forest offers no solace, just dread: "the trees are so afraid." Here rain is not "warm and gentle," poised to regenerate the earth as in "Spring"; this is a rain of tears and destruction, a rain that soaks bushes in fear and soaks lonely young women in confusion. It was not just through nature that Selma found comfort and tried to make sense of the world; she also heard the world through music. Selma conceived several of her poems as songs, wrote lullabies, and used musical images to convey passions, doubts, and fears, Sometimes these images create a sense of longing: "Song of Yearning," for example, turns on a chord's missing note that if discovered would transform a melody and a life into happiness. Music, like nature, can be a refuge in a time of growing sorrow, when, as Selma counsels in "Song," "the sunny time/that taught us how to laugh" is over and "discord prospers--/ despite the world's resistance." Aching for a normal life without the fear of imminent war, Selma sings to the pleasures she always found in nature--although now they seem even more precious and extraordinary. A rebuke of the present, "A Song for the Yellow Asters" extols the flowers' exuberant beauty: "Nothing of the sadness of the rain," Selma writes, "can mar for me the glowing yellow joy." Selma's "Song of Joy" is also a lyric of defiance. It confronts a terrible winter that freezes passions into "an evil, heavy winter slumber" of exhaustion and despair. There is a depth to winter's cruelty not found in the earlier poems; elements of nature don't evolve over time to emerge from winter, they fight it. The river "hates the ice," battles it, and when the river is victorious, it erupts in boundless joy, overflowing its banks and washing the earth. This astonishing ecstasy is a reminder that the river's longing was great because it was prompted, in good measure, by fear. As life in Czernowitz deteriorated, lullabies and their gift of dreams enveloped Selma's imagination. In "Lullaby for Yearning;' life's "pain;' "death and the end" are soothed by the opiate of dreams. Dreams take you away from the sorrows of the present--a longed for love and a longed--for way of life--to "the most golden of lies," where, Selma writes, "we'll dream ourselves back to the past." One of her most poignant poems, simply called "Lullaby," imagines an upside-down world set aright only in sleep: "Sleep my child' she sings, "in sleep the world is yours." --The waking world, the one owned by others, is one of desperation and cruelty, but, Selma consoles, "In sleep there is no hate and no scorn." In dreams, spring returns and nature blooms with songs of great happiness; in this inverted world, where life can offer only disdain and cold, the day is dark, but "bright is the night when a dream cuddles you." These lullabies are fantasy, as Selma knows better than anyone else, and, as if to underscore the irony, she confronts her illusions in a lullaby. "Lullaby for Myself" finds Selma taking herself to task for "running away from the naked truth." At the same time that Selma's poems address the desires of a young woman in love, they confront the numbing injustices of modern experience and its bewildering violence. Czernowitz was wrenched by social inequality before the Nazi invasion, and Selma applies her searching perceptions to what was, for many, the desolation of everyday life. Nature and architecture come together in "Grief" to highlight relentless despair. Street puddles are "murky--muddy," "greasy," and "dense," and even Czernowitz's brightly lit windows, which once were the sparkles in a fairy tale, "lack any purpose." Rain 'Just pours and pours"; fog is "sticky" and "sludgy"; and park benches that insects had fought over in kinder times are now "sad, and wet, and gray." In a world where "people are too sad to even hate," grief's most prominent victim is the poor farmer who, "with his collar raised," worries if his money will "see him through." Selma's later poems evoke her own numbing dread. "Necklace of Tears" begins, "The days weigh damp and heavy, full of wild, anxious grief. I am so cold and empty that I am about to die of fear." "Wrapped in yearning," Selma can, however, still find solace in others who, hearing "the music of my song," would share her grief. But at her most despairing, even yearning dies. In "Sonnet," Selma is so drained that she is too weak to carry melodies, and in "Tired Song" even her "most precious song/ is gone." That is the burden of utter aloneness and the unbearable emptiness--the soundlessness--of a squandered world, a squandered future. The mayhem of an increasingly purposeless world tore at Selma, and her poems voice the perplexities of living in a time that was so at odds with her sense of humanity and justice. "Do You Know ... " is a crushing example. Selma evokes her chaotic and threatening environment through a mirror of nature/fantasy: "Do you know, .. how Lady Night, afraid and pale,/ does not know where to flee? "; "Do you know ... how the frightened woods can't teIl/is it or is it not their realm...?" Selma forces us to face her alarming, confusing universe--and to imagine it through her eyes--by asking, "Do you know ... ?" first of nature, then of herself: "Do you know ... how I walk, afraid and pale,/ and don't know where to flee?/ How this frightened girl can't tell / is it or is it not her realm, ... and isn't my mouth, so pale and confused,/ the one that's really crying?" In this devastated world, it is Death who laughs. Still, even in her bleakest moments, Selma cannot repress life's energies, excitement, and promise. One of her last poems, titled "Stefan Zweig," after the Austrian writer, celebrates Zweig's bold vitality and exuberance: "Luminous, radiant, thundering life." Life's "searing yearning" is, in the end, as Selma discovers through Zweig's passion for the world, the desire for connection, for people, and for the living presence of language. This is life that "grabs you and holds you"; this is life that Stefan Zweig, and Selma, wanted to grab in words. "What no wild creek, no whirlpool, no flood can do,/ this breathing has done many thousands of times,/ this hot, this consuming, this crystal-clear word." This is life that words can talk about to lovers, friends, enemies, and even to people living thousands of miles away, like Stefan Zweig, who thought he could escape Europe's demons by going into exile in Brazil. It is one of the war's great tragedies that Zweig, unable to imagine life without Nazi terrors, committed suicide the same year Selma died. Selma never writes the word Nazi, never mentions the Iron Guard or the words ghetto, murder, or deportation. We know the history of Czernowitz and enough of Selma's fate to be able to contextualize the symbols of dread, threat, fear, and death when they appear in her poetry. One terrible event, however, did push Selma to write explicitly about executions and mass graves. When German SS troops and their Romanian allies invaded the Bukovina, randomly murdered Czernowitz's Jewish citizens, and buried them by the Prut River, Selma wrote her passionate protest, her passionate appeal to life: "Poem." "Poem" begins with a near dream of Bukovina's natural beauty; "The trees are bathed in softly shimmering light," a child greets the moon, and bushes are "marvelous," changing color with the wind and moonlight "as if prepared to bloom." Then, after this fantasy, we find words of ebullient, willful, and defiant joy: "I want to live;' Selma cries, "for life is mine,/ mine and yours./ Mine." When Selma shouts what she has yet to do in this world ("I want to laugh, to bear all of my burdens/ and want to do battle, know love and know hate./ I want to hold heaven in my embrace/ and want to be free and breathe and scream. "), she is claiming her right to a future, like everyone, everywhere. She is demanding that life not be stolen from her, like it is from the exquisite bud in "The Storm" that frost would condemn to "death before it's had a chance to live." Selma can make no sense of the carnage that surrounds her, can find no convincing reason: "You want to kill me?/ Why?" And the earth is also in despair: "With a thousand flutes/ woods weep." Selma knows how fragile life is: how life "roars and laughs," but "overnight/ I am/ dead." Selma joins the dead: "the numbers pile up./Never rise again./ Never/ and/ never." In empathy, the poem itself, its very form, shrinks to one word. As Czernowitz darkened with fear, incongruity, and bewildering hatred, Selma turned to poetry to try to make sense of the senseless. The moon was still there, so were the budding trees, explosive rain, and hungry farmers; the world was still there, but it too had become opaque, stricken, unresponsive. Traces of the world's wonder and beauty linger in memory, desire, and hope, but the reality of executions, of bodies stacked in death pits, overwhelms even these traces. Although Selma first reached a larger audience in 1980 with the publication of the German edition of her poetry, it took nearly twenty years for her poems and life to capture the attention of a broader public. The German press Hoffmann und Campe reissued her poetry, accompanied by an audio book, in 2005, and translations of her work into Dutch, Spanish, French, and now English are in circulation. Men and women devoted to Selma have turned her poems into lyrics and her life into plays. Today Chernivtsi residents arc learning about Selma, too. In September 2004., a plaque was placed on tenement apartment where Selma and her family lived, and our mother was invited to Chernivtsi to be a part of the ceremony. Surrounded by officials and professors, Mom began her short speech with a question: "How can I tell you about someone I never met?" Mother had never traveled to Czernowitz before. She knew about Selma, knew that we had relatives who perished in Michailowka. But, like most of us, she knew little about them, little about Selma's life--a common pattern among the children of Jewish immigrants, still overcome by the dense silence that is rooted in fears of asking and of remembering. Mother regretted that silence and was grateful to the professors, the writers, the composers, and the journalists who had, in Mom's words, "given Selma back to us." Most people in Chernivtsi had not heard of Selma or the city's multiethnic history as Czernowitz. In spite of the highly visible double-headed eagles and ethnic houses of Austrian vintage, Chernivtsi residents knew little about its vaunted past as a cosmopolitan, multicultural haven. We were stunned to realize that even by the end of the twentieth century most of Chernivtsi, including its Jewish population, would not have recognized the name of Paul Celan. This ignorance is a product of Chernivtsi's experiences since World War II and was magnified by the Soviet Union's hold on history teaching. Soviet censorship meant that the history taught in Chernivtsi's schools said little about the Jewish dimension of the Holocaust. In addition, since Soviet history taught that the world calendar began after liberation from the Nazis in 1944, Chernivtsi's Austro-Hungarian past and its literary accomplishments vanished from print and from schools. Only after Ukraine became independent was it possible for Chernivtsians to recover the Czernowitz dimension of their past. Now the city itself tells some of that story, with plaques and other commemorative markers signaling the homes or places of work of some of its German-speaking, Romanian-speaking, Yiddish-speaking, and Ukrainian-speaking poets, musicians, and authors. Czernowitz, the city "where human beings and books used to live," could only become part of Chernivtsi's cultural history after its remarkable literary endowment was translated into Ukrainian. For that task, we have to thank Peter Rychlo, the University of Chernivtsi's professor of German, who has devoted his intellectual career to the Bukovina's contribution to German literature. His efforts to translate Czernowitz poets into Ukrainian has had a defining impact on Chernivtsi's--and on Ukraine's--sense of history. Rychlo's translations of Selma's writings mean that they can be taught in local high school classes; now Selma and her poetry too can become part of Chernivtsi's living past. In the summer of 2007 we spoke with a dynamo of a teacher at Chernivtsi Gymnasium Number 5, Orysya Pospolitak. She is a driving force in efforts to restructure local pedagogy to incorporate the past long ignored by Soviet and previous Ukrainian administrations. It was serendipity that Pospolitak's high school was the same one that Paul Celan attended, and she has taken advantage of that connection, building a small museum devoted to his life and poetry. She has also encouraged students to think and write about Czernowitz. One of her pupils, Oksana Nastasn, won an international essay contest about Jews in the Holocaust--and, to our great joy, won with an essay about Selma Meerbaum- Eisinger. Oksana lets us see Selma through the eyes of an age-mate, which helps us better grasp why Selma's life--and her poetry--were so absorbing to a fourteen-year-old Ukrainian. Struck by their similarity in ages and writing with pointed empathy, Oksana voiced outrage at the human cruelty that truncated such a talented life. Oksana began her essay with a citation from the diary of Anne Frank. Oksana recognized other, personal truths in Selma's poetry as well. She felt the longings and frustrations so plaintively expressed in Selma's verses, and she saw Chernivtsi in Selma's Czernowitz: the beech trees in their many colors, the sorrowful rains, the glorious asters, the roses frozen before they could bloom. Selma's poetry, so accessible to her present-day age-mates, can help bridge the past of Czernowitz to the Chernivtsi of today. By making Selma part of a living history, Oksana is also expressing a hope and promise of what Ukraine can become. The Holocaust shadows Selma Meerbaum-Eisinger's poetry, and no embrace of her work can be divorced from the bleak times in which it was written. The resurgence of Selma's life and poetry--the ways they have been made into living pieces of art--helps us see the past, but a past that is often too sorrowful to face. Art and music, theater and poetry can pull us in and put these terrible times within reach, but they cannot put them to rest. The terrible truth remains: no play, no song, no poetry reading can ever repair history, can ever bring Selma back to life. Czernowitz, like Selma, radiates a certain allure. In the summer of 2006, a group of Czernowitzers (those either born in the city or descended from those who were) returned to Chernivtsi for a reunion, and this trip prompted many to consider their fascination with this place so far away in space and time. Czernowitz was a dream, a dream then and today. It is the spirit of Czernowitz, we think, that is the allure--"civilization's" ideal and hope. Selma's life was torn by what Hannah Arendt, in her book The Origins of Totalitarianism, called civilization's "subterranean stream," its terrible underside, but it was civilization's ideal and hope that shaped Selma in Czernowitz, animated her, and even gave her the heart to face its ugly realities. Perhaps that explains why Selma's spirit--the spirit that could tell Rena, "We have to endure"--is so compelling, why Selma's life and her poetry inspire even in the present. This is Selma's legacy. Our road to Czernowitz was one of great amazement, since neither Selma nor Czernowitz had been part of our living pasts. We were trapped in the silences, in the fears of coming to terms with irrational and unbearable histories. It took the passions of others to make them alive for us, and we are grateful. In his acceptance speech for the Bremen Prize, Paul Celan said he came from a place "now fallen into historylessness"; a place where there was no history in the making, where human beings who should have been creating histories in the course of living their lives had been denied that right. "Historylessness" has no reparation, but it can be remembered and it can be mourned. We, everyone of us, can grieve that terrible loss and make "historylessness"--anywhere--part of our living memory. This is Selma's legacy, too; she is part of the mourning. In her last poem, Selma describes tragedy: "to give yourself away/ and then to see that no one needs you,/ to give all of yourself and realize/ you'll fade like smoke and leave no trace." Celan said that a poem is "essentially dialogue, [it] can be a message in a bottle, sent out in the--not always greatly hopeful--belief that somewhere and sometime it could wash up on the land." Writing poetry was the most human of acts for Selma, an act of connection, and connection was the trace--the history that a tragic, inhuman world would erase. Sharing Paul Celan's hope, we like to think that in the very act of writing "Tragedy," Selma tricked tragedy, renounced it, even if "not always greatly hopeful" that she had succeeded. Miracle or no, her poetry has come on shore right here; it is still talking, still part of the world, still connecting human beings across decades and continents, still grabbing life. "Harvest of Blossoms: Poems of a Life Cut Short," by Selma Meerbaum-Eisinger, can be purchased by clicking here. Copyright © 2008. Museum of Family History. All rights reserved. Image Use Policy.